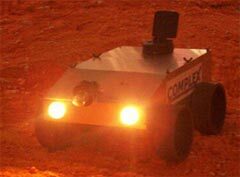 The final version of the robot was a bigger version of this robot. It should have more push-pull outputs to support the motors for the arm, should be able to send back sensor information, have lights and have a tilt option for the camera. I wanted to build it as universal and modular as possible. Later in the project it proved to be a very wrong decission.